In the present work, the effect of pyrolysis conditions on biochar yield obtained from Chlorella vulgaris was examined statistically and the pyrolysis kinetics was determined using a thermogravimetric analyzer. For the production of biochar from microalgae, pyrolysis was carried out at the temperatures of 300, 500, and 700 °C, with the heating rates of 5, 15, and 25 °C/min, retention time of 0, 15, and 30 min, and nitrogen flow rate of 100 ml/min. For the examination of pyrolysis kinetic parameters, dried microalga was heated up to 900 °C at four different heating values of 5, 10, 25, and 50 °C/min at a constant nitrogen flow rate of 40 ml/min. Optimum pyrolysis conditions and the most suitable pyrolysis kinetic model were determined for Chlorella vulgaris. According to the obtained results, it was seen that Chlorella vulgaris could be easily evaluated in thermal conversion processes. 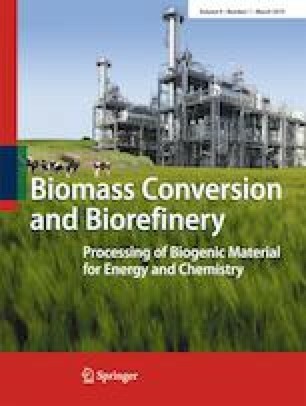 Also, these results provide valuable information for optimization of biochar production, and modeling and designing of new pyrolysis systems using microalgal biomass.